What is a popliteal artery aneurysm and what causes it? What are the consequences of a popliteal artery aneurysm? What are the symptoms? How is a popliteal aneurysm diagnosed? When is an operation for a popliteal aneurysm necessary and what does it involve? Are there any complications of the operations? The main artery supplying the leg with blood passes behind the knee. At this level, it is called the popliteal artery. The popliteal artery is the peripheral artery which is most commonly affected by aneurysmal degeneration. By the term aneurysm, we mean a weak area of the artery bulging or expanding to reach over 1.5 times its average normal diameter. A popliteal aneurysm may be defined as a popliteal artery diameter in excess of 10-12 mm. The aneurysmal wall will continue to weaken and the size of the aneurysm will continue to grow. Aneurysms of the popliteal artery are bilateral in 50% of cases. Quite a few patients with a popliteal aneurysm also have an abdominal aortic aneurysm. Aneurysms of the popliteal artery are usually associated with atheromatous degeneration of the arterial wall; they are more common in men, usually over 60 years of age and smokers. However, there are other causes, such as popliteal artery entrapment (which may lead to poststenotic aneurysm formation) and Marfan and Ehlers-Danlos syndromes (in which other anomalies coexist). Finally, there is another type of popliteal artery aneurysms, called false aneurysms or pseudoaneurysms, which occur secondary to infection (mycotic aneurysms) or to injury of the arterial wall. It is quite common that clot forms on the luminal lining of the arterial wall in the aneurysmal area. The clot may disperse into the smaller run-off arteries of the limb, and occlude them (i.e. block them completely), while it may also occlude the popliteal artery itself. The risk in these cases is that the blood flow to the foot may become significantly reduced threatening its viability, because of ischaemic gangrene. Most popliteal artery aneurysms cause no symptoms. The most common symptoms are (i) intermittent claudication, when ischaemia, or reduced circulation, occurs gradually on a chronic basis, or (ii) acute ischaemia with intense pain of rather sudden onset in the foot, when ischaemia is critical. 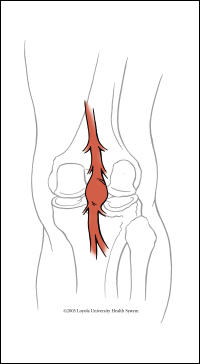 In a few cases, the popliteal artery aneurysm – especially if it becomes large enough – may rupture (“burst”) and bleed with the development of a large haematoma in the leg, or (because of its size, even without rupture) it may compress the adjacent popliteal vein or the adjacent nerve, causing leg oedema or numbness, respectively. An experienced vascular surgeon should be able to suspect the presence of a popliteal artery aneurysm with clinical examination of the limb including palpation behind the knee. The diagnosis is established with an imaging investigation, such as colour-flow duplex ultrasonography or CT angiography, which is required to study the anatomic morphology of the aneurysm, so that an appropriate procedure for its repair is planned. The general consensus is that all popliteal aneurysms causing symptoms should be treated, and that all aneurysms greater than 2cm in diameter – although asymptomatic – should also be considered for treatment. This is because, if acute distal ischaemia occurs secondary to arterial thrombosis in relation to the aneurysm, the risk for major amputation of the limb increases significantly. In certain cases, adjunct (perioperative or intraoperative) intraarterial thrombolysis may be effective in clearing the distal leg arteries from dispersed thrombus. Your vascular surgeon is the only physician qualified to offer all types of treatment for popliteal artery aneurysms, and will help you decide the best method of repair in your particular situation. There are risks involved in any medical intervention; however, these are certainly minimised when the operation is performed by a well-trained vascular surgeon with experience in the specific procedure. He or she will discuss with you the benefits of the operation and the potential risks. When oper repair is performed, swelling of the operated leg is almost unavoidable (and isn’t necessarily a complication), the wound may occasionally get infected (and require antibiotics) or a collection or leak of fluid (lymph) may occur in the wound (however, it usually settles down by itself within weeks). Serious – but fortunately rare – complications are infection, bleeding or blockage of the graft; these may require prolonged antibiotics or further surgery, and could eventually lead to loss of the leg. As in any major operation, there is a risk for chest problems (more commonly in smokers), heart attack or a stroke. All these complications are rare with the preventive measures we take. Complications of the endovascular therapy can be weakening of the arterial wall, bleeding, haematoma formation (this is a collection of blood clots) or dissection of the artery. Another problem may be blockage of the artery of the limb (distally to the aneurysm) reducing the blood flow to the foot. In 1-2% of cases, an operation may be required to fix this problem. Wound infection is rare. Rarely, allergic reactions can occur, especially among people who have had previous allergic reactions to the contrast. If you have a heart condition associated with poor pumping action, such as congestive heart failure, or asthma, you may experience shortness of breath, but this is rarely a serious problem. Also rarely, impaired kidney function, or kidney failure, can occur following any endovascular procedure, especially if you are a diabetic or have kidney disease, in which cases, however, IV fluids will have probably been given to you several hours before the procedure. You should make changes in your lifestyle to help avert the chances to further damage your arteries. If you don’t, you are at increased risk for a heart attack, a stroke or problems with the circulation to your feet.